Little One, God Loves You by Amy Warren Hilliker is just about the sweetest board book I've ever read. It is a rhyming book telling our baby to preschool crowd how much God loves them. The use of repetition and rhyme make this book easy to read and will have your youngsters memorizing the sweet story too! The classical illustrations by Polona Lovsin remind me of my childhood books with a sort of throw back look. They are seriously beautiful. Most of all the sentiment of a parent sharing how much God loves her child just touches my heart! This book would be a perfect addition to any child's collection and an easy choice for the Easter Basket! 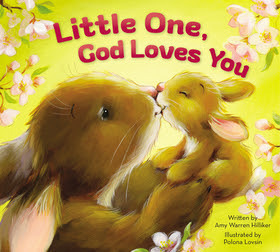 You can find additional information about Little One, God Loves You at Zondervan.com.